ROBsessed™ - Addicted to Robert Pattinson: ROBsessed Giveaway: Enter to win PLAYING WITH FIRE, book 2 in the Hot in Chicago series! ROBsessed Giveaway: Enter to win PLAYING WITH FIRE, book 2 in the Hot in Chicago series! We know all about someone being hot like FIIIIIEYAAAAAH, don't we? No need to simmer down because this book series wants you to stay enflamed. You only have to click a button, which you'll see when you enter. Tweeting the giveaway is optional but gives you more chances to win! 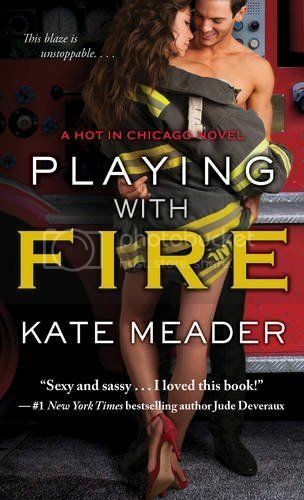 There will be 2 winners receiving Playing with Fire by Kate Meader! Who won the WILD SEASONS series including the newest book, DARK WILD NIGHT??? Congrats Sue and Joy! We'll email you to send your prize. The other fic I read and enjoyed was Wrenfield Hall. I love a period fic and this was delicious with just enough scandal to keep me from biting my nails clear off. We have Bella who lost her father, the only family she had, who just scored a job working for Lord Edward Masen as a housemaid. The UST is primed and ready with this scenario and period stories do UST sooooooo well. Upstairs/downstairs drama is fun and the characterizations of Edward and Bella don't disappoint. Well written and a great time port back to the era of 1870s England. Give it a go!